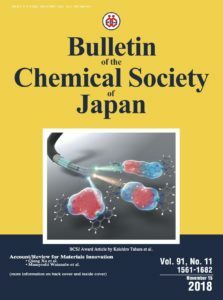 論文：”Synthesis and Characterization of a New Series of Binuclear Pd(II) Biscatecholato Complexes: Non-Innocent Ligand-Based Approach to a Wide Range of Variation in Near-Infrared Absorptions of Mixed-Valence Complexes”, Keishiro Tahara, Tomoya Kadowaki, Jun-ichi Kikuchi, Yoshiki Ozawa, Soichiro Yoshimoto, and Masaaki Abe, Bull. Chem. Soc. Jpn., 2018, 91, 1630-1639.